These hangers are constructed from strong and durable maple wood with a smooth, natural varnished finish for a classic appearance to suit any wardrobe. The trouser bar comes with a non-slip plastic grip coating that will prevent your garments from ending up on the wardrobe floor, becoming creased, and collecting dirt & dust. The flat, space-saving profile will minimise wardrobe clutter at home but also makes the hanger ideal for retail outlets where rail space is precious. Shoulder notches allow clothes with garment straps & loops to be hung without slipping off. The smooth, 360°, chromed swivel hook compliments the wood but also allows the hanger to be positioned in any direction which is vital when used for aligning & displaying clothes, both at home and in a retail setting. 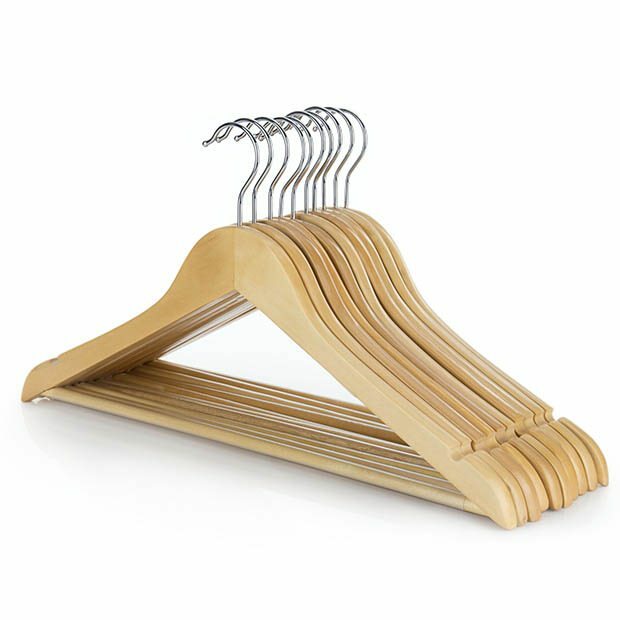 Hang t-shirts, shirts, blouses, trousers, skirts & dresses with one great value multi-purpose hanger that comes with the peace of mind of Hangerworld quality. MULTI PURPOSE: Versatile wooden bar hangers are ideal for shirts, suits dresses and trousers. NON SLIP: Anti slip plastic coating on wooden trouser bar. SHOULDER NOTCHES: Upper shoulder notches for clothes with garment loops and straps. SMOOTH SURFACE: Smooth varnished surface prevents snagging of your clothes. LARGE HOOK: Chromed metal 360° swivel hook. SPACE SAVING: Made from high quality 10mm thick Maple wood. These are great quality hangers at a good price. Well made with no splinters. An excellent product. I have replaced all plastic and wire hangers with Hangerworld’s wooden hangers, and have bought more to accommodate new clothes purchases.